GLOBAL AWARENESS 101 - Let your VOICE be heard and get involved. OUR future depends on it! : Pisces New Moon On Saturday, March 17th by Lena Stevens and Patricia Liles at PowerPath. Pisces New Moon On Saturday, March 17th by Lena Stevens and Patricia Liles at PowerPath. I added the picture gifs above to the message I've shared with you below. I highlighted the part of the message that inspired the picture gifs I chose. The pictures and gifs that I share sum up my interpretation of the current astrological message. These images I've shared are from The Legend of Korra. What is the lion turtle? The lion turtle, honorably referred to as Ancient One by the spirits, is a chimerical hybrid of a lion and a turtle and the largest known animal in the world. In the era of Raava, lion turtles populated the Spirit Wilds, where they served as protectors of mankind by housing human cities on their backs." What does the lion turtle say? 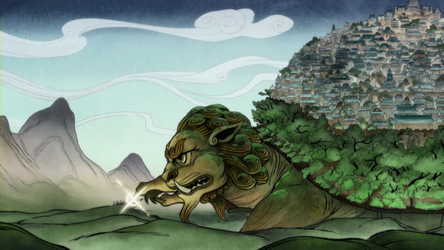 The lion turtle answered that "The true mind can weather all the lies and illusions without being lost. The true heart can tough the poison of hatred without being harmed. Since beginning-less time, darkness thrives in the void, but always yields to purifying light." New Moon is Saturday, March 17 at 7:11 AM Mountain Daylight Time (MDT). Honor the spirit of water during this New Moon. Focus on the life-giving properties of water as well as water’s ability to dissolve and wash away what no longer serves. This is an inner time of reflection and you may not feel very social or outgoing so make sure that if you are with others that they are supportive to you and your process. The nature of the times around this new moon is marked with volatility, emotion, and aggression. Stay focused on the positive and stay out of heated arguments and don’t take others negative reactions personally. We are supported during this new moon to look deep into our own personal wounding and allow as much healing as possible. As always, a new moon (especially this one) is a good time to refine and reset any intentions you have and have been working with. Intend also for new insights to drop in as well as opportunities from unexpected sources. Anything can happen so dream it positively! In a span of a few days we have the end of the zodiacal year with Pisces and the beginning of the solar shift of seasons at Equinox. New Moon in Pisces invites us to take a deep breath and exhale everything that keeps us separate from our own connection to the dreamtime, the Wakan, the Great Mystery. Here is the opening to take the deep dive into the Void – a deeper intelligence permeating all life. Here we are called to surrender our burdens as we are held by the limitless ocean of consciousness. We feel the compassion and acceptance of the Tao, and our own ability to forgive and accept ‘what is’ is strengthened so we may extend the same to others. There is a time for being and a time for doing. This is most definitely a time for being. We extend gratitude to receptive, watery Pisces for her gift at this most feminine of times, more so than at any other time of the year. Intuition, imagination, and the opening into awareness are at an all time high. We are supported to connect with our own inner guidance. So much is being offered for our awakening and healing and many are rising to the occasion. Chiron (28º) is traveling with the Pisces Sun and Moon (27º) ~ a full out healing Moon of our inner most secrets and woundings. Chiron offers us the parting gift of healing our addictions and preoccupations with escapism, denial and martyrdom and helps us to open our hearts to the difficulties of our current world situation as we release it all to Earth and Sky, our Mother and Father to prepare for the new. This Moon’s alignment is Chiron’s parting gift in Pisces as preparation is made to change signs in April into Aries moving out of a feminine, water sign and into the masculine, fire sign Aries for the next 7 years. Healing energy from this asteroid/centaur teacher-healer has occupied the sign of Pisces for seven fruitful years. Chiron has facilitated the healing of women bringing them into personal wholeness as they reveal the unspoken repression of millennium. Chiron is the bridge between Saturn, the traditional form of wisdom and discipline, and Uranus and the otherworldly, transpersonal planets. Chiron is our mentor in radical shifts of healing. The feminine wounds have been awakened and heard in Chiron’s sojourn through Pisces. Reconciliation is powerfully underway. Now Chiron is ready to bring his healing magic to bear in Aries for our brothers, fathers, lovers and our own inner masculine and to teach us the healing power of the archetypal masculine’s right use of action, protection and balance. On New Moon day March 17, Mars, ruler of Aries, our most direct, action-oriented planet, quick to thrust, full of passion, desire and heat, will change signs and move into Capricorn where it is exalted, well placed. Mars being a very martial planet works well with the disciplined behaviors, goal oriented and law-abiding focus of Capricorn. Not only will Mars change signs, but also will be very soon after ‘out of bounds’, which has the effect of setting it free, becoming more independent, untethered and infused with a radical action and intensity. ‘Out of Bounds’ means it no longer travels along the path of the Sun as the other planets do, instead it is outside the most north or south (in this case south) path of the Sun – out of the Sun’s influence so to speak. Woo hoo! Says Mars. We’re in for a hot time now! With Mars ruling such things as sharp objects, guns, machines, the military, athletic achievement, accidents, and aggression, let’s hope the patience and diligence of Capricorn has a mitigating effect. Mars will be in a challenging square relationship to the Sun/Moon/Chiron at New Moon. Stay calm and grounded, keep busy and avoid the heat of anger; focus your restlessness and irritability into action, drive mindfully, reflect before you blurt, soothe your liver. Mars is joining Saturn (8º) and Pluto (20º) in Capricorn until mid May meeting Saturn on April 1 and Pluto on April 26. This infuses much energy behind our goals and whatever we feel needs a radical makeover. Put these dates to good use to forge ahead with your plans. Have courage to step out and declare yourself in ways you have only imagined to signal the universe you’re ready to assert yourself to express who you are. Aries retrograde is a time when we can observe our inner masculine and bring it into balance. We can watch the collective events in the news recognizing that the Aries, Mars and masculine energies are on display. Spirit has arranged for an intensification of events to focus our attention on the current masculine power system and how it operates. With Jupiter in Scorpio retrograde (23º) generously trining the Sun/Moon/Chiron, our path is eased and open to understanding the larger perspective of the transformation we, as a species and a planet, are traversing. Jupiter in the sign of death and rebirth helps us own our part in the dance reflected to us from the outer world and transform it into an inclusive, cooperative expanded vision. We are the visionaries we have been waiting for.